Chile's military has turned security control of earthquake-damaged communities over to the president's reconstruction chief, Cristóbal Lira. But while security and aid efforts are back in civilian hands, the armed forces continue their relief work. Soldiers and sailors are helping with clean up, repair, construction, medical and other efforts. Army troops helped rail workers fix a damaged railroad. The navy's central focus is helping rebuild the port city of Talcahuano. Meanwhile, US Air Force crews that helped airlift supplies have ended their mission. Brazil sent some Black Hawk helicopters to reach remote areas, too. Unmanned aerial vehicles will fly missions in Chile for the first time. A pair of Aerostar UAVs will keep watch over areas still recovering from the Feb. 27 earthquake, La Tercera reported. The UAVs are on loan from Israel's Rafael, which will also provide a crew. Chile's air force arranged for the loan. The Aerostar can stay aloft 12 hours and can carry a 110-pound payload that can include day and night cameras. Chile's armed forces have been shopping for UAV systems, and some will be on display at this month's Fidae air show. Elbit Systems, BEA Systems are other UAV manufacturers at the show. As Chilean troops continue providing aid and security in earthquake-hobbled communities, reports indicate a broad acceptance of the military. About 14,000 soldiers have been maintaining order after looting and mobs struck ravaged areas. "Soldiers organized lines for residents to enter banks, pharmacies and gasoline stations," the New York Times reported. "And for the most part, emotional and exhausted residents...embraced them." Indeed, accounts are widely supportive of the military's response. The armed forces also have provided a vital pipeline, using trucks, helicopters and airplanes to deliver aid. That was a role the military trained for, but taking control of the streets was not. That's where the earthquake relief operation is serving as a test of the military's reforms in post-Pinochet Chile. And if Chileans are embracing their soldiers, they are also demonstrating that the country has turned a page in its history. The Feb. 27 earthquake marked the first time troops took to the streets since Gen. Pinochet stepped down and a civilian government took over. Some leftists, recalling the 1973-1990 military dictatorship, disapproved of the mobilization. Pinochet's legacy remains a political flashpoint. "But the scenes of Chileans' embracing soldiers who aided in rescue and reconstruction efforts after the huge earthquake last month make all that divisiveness seem an eternity ago," another NY Times article notes. Chilean air force planes filled with relief supplies are landing every 30 minutes at the airport in Concepcion. A KC-135 tanker-transport that was delivered just days earlier was pressed into service. Bell 412 and UH-1H helicopters are reaching areas cut off by the Feb. 27 earthquake -- all part of the "air bridge" reaching Chile's south. Some of the injured have been flown to hospitals, while the air force deployed its own field hospital in the town of Curanilahue. Chile's army, meanwhile, continues patrolling Concepcion and other devastated areas, while also operating field hospitals. It is playing a principal role in distributing food and supplies, operating Cougar, Super Puma and MD 530 helicopters in addition to CN 235 airplanes. The navy is helping keep the peace in Talcahuano, as it tries to get its own base in that city back to normal. The Asmar shipyard, owned by the navy, is "unrecognizable" after the tsunami, the navy says. Its shops were destroyed, floating docks were damaged and ships being serviced were cast onto the shore. Some boats in the harbor sank. Despite some initial missteps, the military's efforts are proceeding well by most accounts. Indeed, its labors are a critical test. Disaster relief is one of the armed forces' main missions, especially in a nation where war is a remote possibility. The earthquake exposed Chile's vulnerability to its own geography. With the single north-south highway cut off, air and sea transportation became crucial links. Many Chileans are blasting their government for a slow response to security problems in the wake of the Feb. 27 earthquake and tsunami. 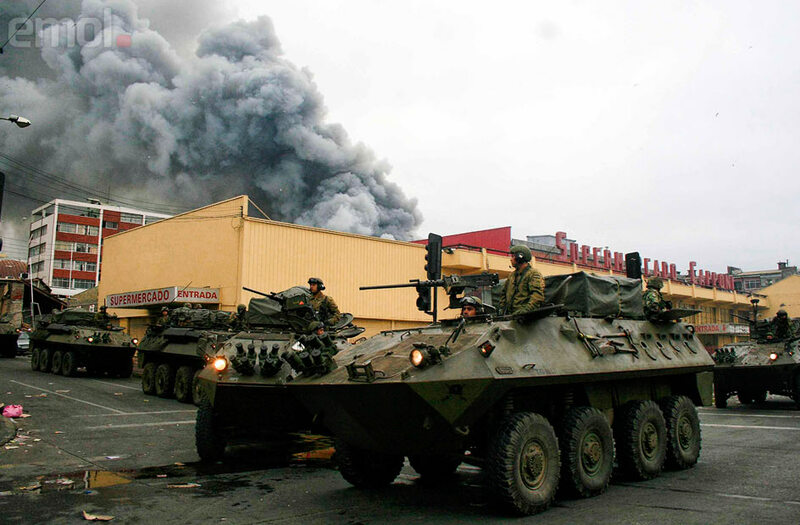 Some mayors and military commanders -- sensing an outbreak of crime amid the ruins -- urged President Michele Bachelet to send in troops and impose a curfew immediately. But Bachelet hesitated, according to various press reports. To her and some of her advisers, the thought of soldiers patrolling streets and curfew restrictions was a bitter reminder of life in Chile after the 1973 coup led by Gen. Augusto Pinochet. But looting, theft and shootings soon came over the most heavily damaged areas. Police forces were quickly overwhelmed, and public angst swelled. With the situation growing out of control, Bachelet acted. Two days after the 8.8-magnitude earthquake, the president signed a special order granting the military control over affected communities. A 16-hour curfew was imposed, resulting is scores of arrests. On March 4, Defense Minister Francisco Vidal declared the security situation under control. Meanwhile, government and military officials pointed fingers at one another. The interior minister accused the air force of being slow to provide helicopters to the epicenter zone, which delayed the emergency response. The head of the air force insisted that two hours after the quake, aircraft were "ready to depart wherever we were told." The navy has a major base right in the devastated area of Concepcion, yet its personnel wasn't much visible in emergency operations. Why? According to a fire department official interviewed on radio, the base itself was heavily damaged and the navy had its own casualties to deal with. Update: In an interview with the New York Times, President Bachelet dismissed "speculation" that she held back on sending troops into disaster areas because of her own experience under military rule. Chile's navy has been the military branch most damaged by the Feb. 27 earthquake. The ensuing tsunami destroyed much of the Talcahuano naval base and most of the Asmar shipyard. A new ocean research vessel, set to be launched the same night of the quake, suffered some damage. Some coast guard boats were lost. An offshore patrol vessel being built for Iceland was badly damaged. Navy commander Adm. Edmundo Gonzalez said the navy's capital spending plans will be re-prioritized to get Talcahuano and Asmar back to normal, a process that could take years. The navy has insurance coverage for a lot of the damage. The submarines based in Talcahuano escaped any serious damage, as did an Ecuadorian sub undergoing refit at Asmar. The blog Armada de Chile y Otros is doing a good job tracking the navy's damage and its role in the relief operations.